Individuals who suffer from a recurring medical condition, as well as those who experience an injury of one form or another, maintain the same overall goals; manage the pain, find a successful treatment option, and heal as quickly as possible. Fortunately, chiropractic care helps promote healing and strengthen the body by working on it in its entirety. Custom orthotics can add to this effort by helping better distribute weight bearing and leveling out your foundation. Experienced chiropractors understand there are some other treatments in addition to chiropractic care that help aid pain management, increase mobility, and decrease healing time. Depending on the condition, individuals may experience a wide array of benefits from blending these treatments into their chiropractic treatment. Orthotics created to “brace” the body part that is not at full performance strength allows it to heal faster. Sometimes a person’s injury requires little or no movement, and orthotics serve this scenario well by bracing the bones and joints of the foot in a better position. Sometimes, you just don’t need that big uncomfortable boot to heal. Feet, for example, bear a great deal of the body’s weight, making them one of the more difficult parts of the body to achieve healing. Orthotics provide the weight bearing assistance needed to give the body time to repair and heal itself. Did you know…bunions are actually bony calluses that form in response to excessive stress on that area of the foot? Orthotics can reduce the formation of bunions and help correct one that has already started to form. If a part of the body is not functioning adequately, the entire body may be unstable. This is an unsafe situation that can actually cause other injuries. Orthotics are tools that stabilize the body by providing extra support, to the arches of the feet and add shock absorption to protect the joints above the feet: ankles, knees, hips, pelvis and spine. A variety of injuries and other health conditions cause misalignment of the spine. Certain orthotics assist the body in achieving alignment over the course of time, especially when combined with chiropractic adjustments. Used in the course of chiropractic treatment, orthotics provide a valuable factor in the person’s recovery. Marrying the regimens of chiropractic care and orthotics supercharge the healing and recovery time. 6. Helps eliminate painful symptoms. With chiropractic visits working on the body as a whole, and orthotics offering support and stabilization, patients often show a decrease in painful symptoms faster than employing one or the other. Problems like Bunions, Plantar Fasciitis, Sciatica and back pain can be minimized with the help and support of custom orthotics. 7. Reduces wear and tear on the hips, pelvic and spinal joints. This is particularly important if you already have some level of arthritis in the hips, Sacralilac joints or spinal joints. 8. Increases the chance of returning to normal activity. 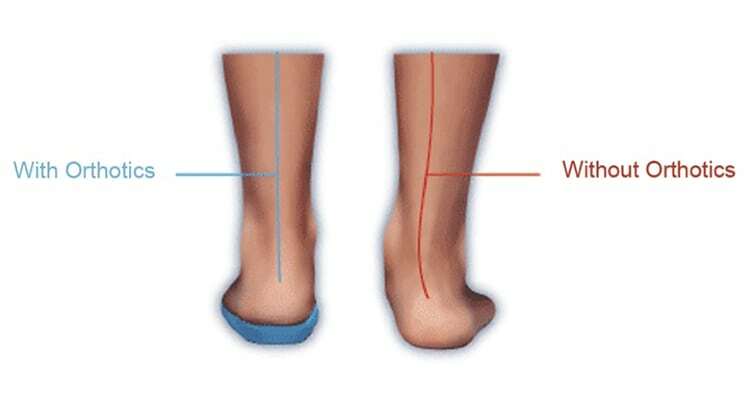 Utilizing orthotics gives the area that is under-performing stabilization and support. This allows a person to more likely return to work and other daily activities faster than chiropractic treatment alone. 9. Minimizes reliance on medication. A chronically painful medical issue is quite difficult to manage without medication. Long-term use of certain medications can create health and addiction issues, leaving a person with one more problem to handle. The combination of chiropractic care and orthotics empowers many individuals to lessen their dependence on drugs. 10. Maximizes quality of life. While being treated by a chiropractor, a patient’s body may take weeks or longer to stabilize before it completely heals. When orthotics are coupled with chiropractic care, these same people are able to achieve a greater feeling of stability, and consequently, independence. This effect is perhaps the most significant benefit of employing the two practices, as quality of life is immeasurable. No matter the injury or condition, an experienced chiropractor can determine the best regimen for each individual patient’s needs. By consulting with chiropractors who also utilize orthotics in their practices, most health issues can be tackled more effectively which, in return, provides even greater results. Dr. Hoch (pronounced Hoke), is a 1988 Graduate of Peotone High School and a 1990 Graduate of Joliet Junior College. She Received both her B.S. in Human Biology (1991) and her Doctorate of Chiropractic (D.C.) (1993) from The National College of Chiropractic in Lombard, IL. She also received her graduate and post-graduate certifications in Acupuncture from NCC. This article is copyrighted and may not be copied or duplicated in any manner including printed or electronic media, regardless of whether for a fee or gratis without the prior written permission.